Epithelial tissue. Simple columnar. Atlas of Plant and Animal Histology. The image is from gall bladder. Put the cursor hover and see where the image comes from. 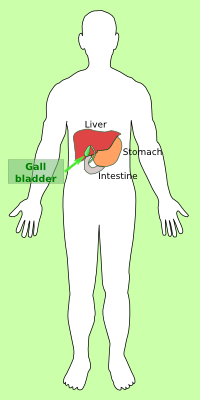 Organ: gall bladder, epithelium, simple columnar. Species: human (Homo sapiens; mammal). Technique: haematoxylin-eosin, 8 µm thick section, paraffin embedding. 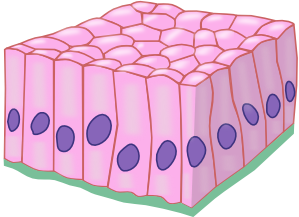 Simple columnar epithelium is composed of taller than wider cells, which contain rounded nuclei located in the basal part of cytoplasm. The apical surface of the cell frequently shows cilia that, thanks to their movement, can transport substances over the surface of the epithelium. 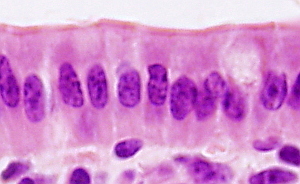 Ciliated simple columnar epithelium can be found in the uterine tube. Microvilli may also be present in the apical surface of simple columnar epithelium, as in the intestine or gall bladder epithelium (the large image above). Microvilli increase enormously the absorptive surface of the epithelium. Epithelial cells are anchored to the basal lamina by hemidesmosomes, and to the neighboring cells by desmosomes. There are cell junctions close to the apical surface, tight junctions and adherent junctions, that seal the intercellular space, avoiding the substances to cross the epithelium through the intercellular space. The latero-basal membranes are highly folded and form interdigitations with the membranes of neighbour cells. Simple columnar epithelium can be found in the intestine, gall bladder, collecting ducts of the kidney, and uterine tube. Simple columnar epithelium, small intestine. Most of the epithelial cells are enterocytes. Microvilli can be observed in the free surface.